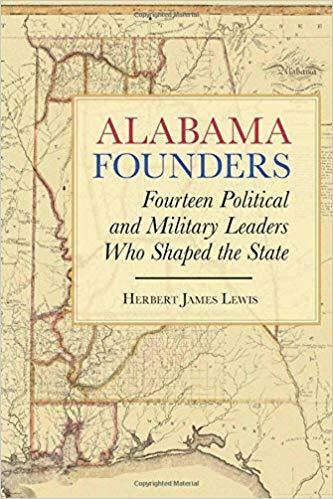 As the title suggests, these are short, usually ten-page biographies of men—they were in fact all white men—who helped settle this land when it was part of the Mississippi Territory, which had been established in 1798, then fought to have that territory divided into two states and, after Mississippi was admitted, helped guide Alabama’s bid for statehood through the U. S. Congress. Statehood was bestowed on December 14 of 1819. The 14 subjects can be roughly grouped, with 5 of them having migrated from Virginia to Georgia near the Broad River and then to Alabama. Many were experienced politicians/legislators, having held high office in Georgia. This Broad River Group were among the first here, responding to “Alabama Fever,” the prospect of great wealth in buying the newly available fertile lands. Some 22 million acres became available in 1814, after the defeat of the Creek Indians. Later, in 1830, 11 million acres became available in Mississippi after the defeat of the Choctaws and the Treaty of Dancing Rabbit Creek. These planters had, along with many of their kind, already depleted the land in Virginia through intensive cultivation of tobacco and were doing the same in Georgia. They also favored the slightly milder climate after the rigors of the Georgia up-country. In Alabama, however, cotton, not tobacco, would be king. The Broad River Group would be associated with establishing banks and with creating some unusual usury laws. The rate of interest on a loan could be ANYTHING, as long as the contract was in writing. Otherwise, it was to be held to 8 percent. This group provided Alabama with its first state and national legislators, judges, lawyers, and governors. The names are familiar: Bibb, Pope, Walker, Moore, Clay, Pickens, King—there are counties and of course buildings on the UA campus named in their honor. The first man covered, Judge Harry Toulmin, may be one of the most admirable. Toulmin had been president of Transylvania Seminary in Kentucky, the first institution of higher education west of the Alleghenies. He helped arrest Aaron Burr, wrote the first Law Digest for Alabama, and advocated humane rights for slaves and the end of the trade. Several of the early 14 fought in the Creek Wars in some capacity—at the Battle of Burnt Corn Creek or Horseshoe Bend or other battles, the most famous fighter being Samuel Dale, the “Daniel Boone of Alabama.” In November of 1813 Dale and two companions in a dugout attacked 11 Creek warriors in their canoe. With one foot in each craft, Dale clubbed two Creeks to death then jumped into the Indians’ canoe, killed two more, finishing by bayoneting the Creek chief. Dale was the first Alabamian to receive a state pension. Lewis includes parts of a speech, delivered “with a sneer of hatred and defiance” by Creek Chief Tecumseh, which I had never seen before. The Creeks did not go gentle into the Oklahoma night. Although all these men were born elsewhere, even in the state’s earliest days, there was suspicion of Yankees. Henry Hitchcock, an attorney who would be Alabama’s first attorney general and chief justice of the Alabama supreme court, while campaigning to become a delegate to the Alabama constitutional convention, gave the same speech over and over. If we fast-forward to the years of the civil rights movement, individuals coming to Alabama from the north will be labelled communists. Lewis, the author, suggests Gabriel Moore “was perhaps the most interesting” of the founders. Moore endured a nasty divorce and then fought a duel with his ex-wife’s brother, but, a staunch Jeffersonian, he overcame scandal, became governor of Alabama, and was elected to the U.S. House and Senate. Looking back at early state histories, it is always amazing how quickly settlers became the establishment. Nevertheless, Buchanan became our 15th president and King, reelected steadily, our 13th vice president.